ESA’s three Swarm satellites, launched atop a Russian Rockot Booster in November 2013, are orbiting Earth in a precise formation to collect multi-point measurements of Earth’s magnetic field. The mission has the goal of separating the different magnetic field components stemming from Earth’s core, mantle, crust, oceans and ionosphere – all of which contribute to Earth’s magnetic field that protects the planet and its atmosphere, also looking at internal processes in Earth’s core. 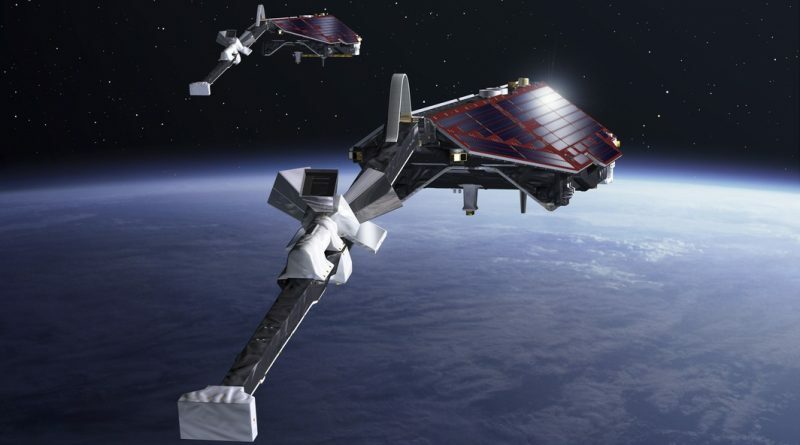 The use of a three-satellite constellation enables multi-point measurements to reveal temporal and spatial variations in the magnetic field. Affected by this latest conjunction alert was the Swarm B satellite which is the higher-orbiting of the trio, currently residing in an orbit of 502 by 504 Kilometers, inclined 87.75 degrees. Swarm A and C are being kept in precise formation in a 439 x 443 km orbit. This constellation allows the orbital planes of the two segments to drift apart over the course of the mission so that observations for any given location can be made at different local times. 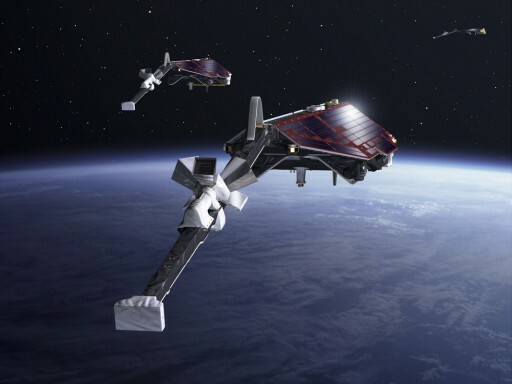 ESA was notified of a possible close encounter between the Swarm B satellite and a piece of space debris several days ago through the Joint Space Operations Center that processes data for all sizeable orbiting objects provided by space surveillance sensors operated by the U.S. The conjunction was forecast to occur on January 25 at 23:10:55 UTC and initial assessments showed a miss distance of 361 meters, triggering a risk above the 1-in-10,000 threshold. If the risk of collision is assessed to be greater than 1/10,000, mission operators typically elect to plan for an avoidance maneuver if possible within the technical constraints of the mission. The object coming close to Swarm B is a fragment of the Kosmos-375 satellite that launched in October 1970 on a mission to perform an Anti-Satellite Weapon demonstration. It performed a non-destructive intercept of the Kosmos 373 ASAT target that launched ten days prior. After the test, the three-metric ton craft self-destructed, resulting in at least 47 debris pieces of which 15 (including the parent object) remain in orbit, flying at altitudes between 478 and 2,019 Kilometers. The conjunction for Swarm B involves Object 1970-091U, currently in an orbit of 498 by 764 Kilometers, inclined 62.74 degrees. Object 091U, according to its radar cross section, measures around 15 centimeters in diameter and could easily destroy the Swarm B satellite if a collision would occur. 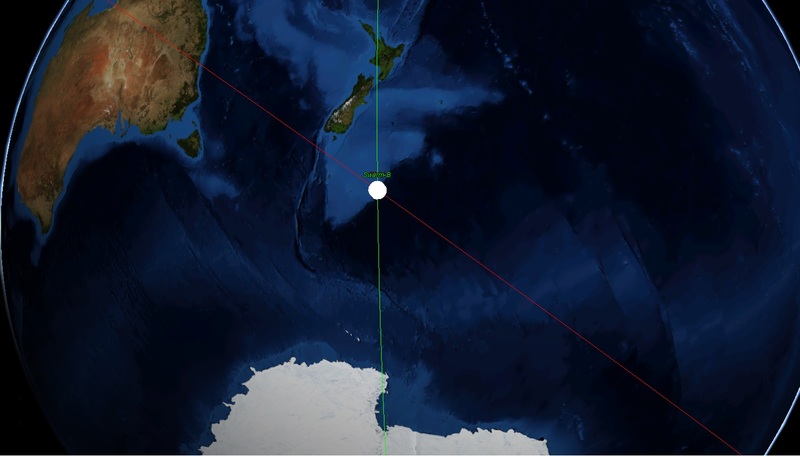 At the time of closest approach, Swarm B will be over the ocean, just south of New Zealand on a pass taking it due north over Wellington. 091U will intersect Swarm B’s path as it heads from north-west toward south-east, predicted to pass just a few meters below Swarm’s orbital path. Calculations showed an along-track miss distance of 361 meters and a radial miss distance of 21.7 meters, however, uncertainties in orbital tracking are on the order of 1,000 meters in the along-track direction, creating a potentially hazardous situation for Swarm B. Meetings were held at the European Space Operations Center on Tuesday to initiate plans to prepare for a collision avoidance maneuver and move Swarm B out of harms way should updated tracking data still show it on a potential collision course. 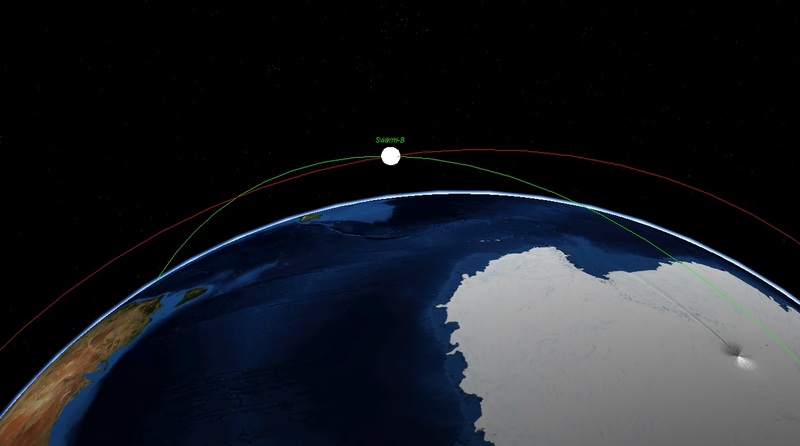 A maneuver plan was put forward to increase Swarm B’s velocity by 10 mm/s to very slightly raise its orbit and bring the radial miss distance to 56 meters and along-track separation to 746 meters, taking the conjunction out of the red threshold area. 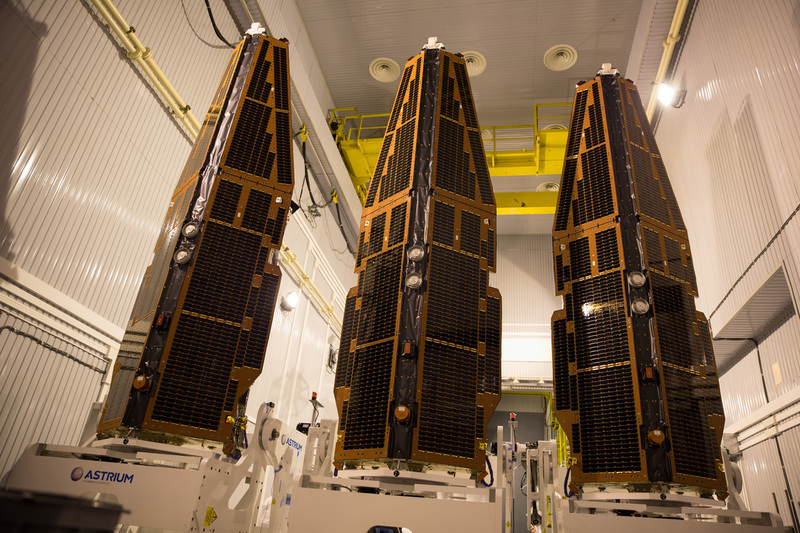 Commands for the 44-second maneuver, planned at 22:23 UTC on Wednesday, were radioed up to Swarm B at 7:51 UTC when it passed over the Kiruna ground station in Sweden. A meeting held at 10:40 UTC used updated orbital data for a final assessment of the situation and determined that, based on the latest orbital simulations, the conjunction was no longer violating the threshold and the avoidance maneuver could be canceled. Commands were sent to the satellite at 11:02 UTC to disable the planned maneuver and save precious propellant. Swarm B is not fully out of the woods yet as future encounters with this piece of debris are a possibility and will be monitored closely. 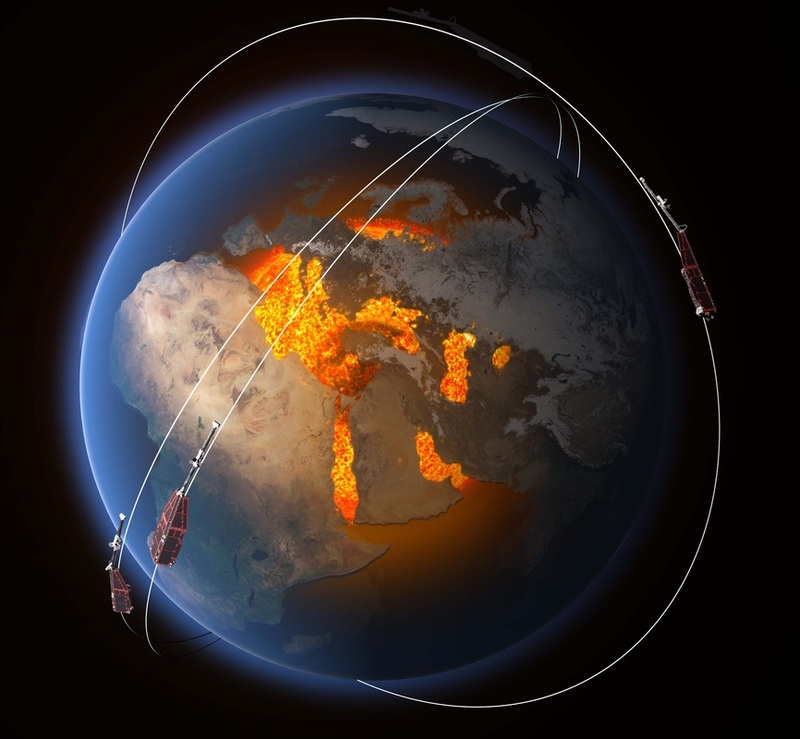 Over the course of the mission’s first three years in orbit, Swarm has provided the most precise magnetic measurements to date, showing where Earth’s magnetic field is weakening and strengthening, and revealing that the magnetic north pole is migrating east toward Asia and the South-Atlantic Anomaly, where the protective field is weakest, gradually moves west. The Swarm mission also revealed the tides in Earth’s Oceans cause a magnetic response in the mantle which is relevant for a better understanding of plate tectonics. The mission also led to the discovery of a previously unknown jet-stream in Earth’s core, moving around 40 Kilometers per year and likely driven by the magnetic field within the core.